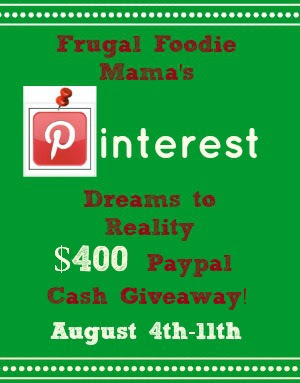 Tobins' Tastes: Pinterest to Reality $400 Paypal Cash Giveaway! Carrie over at Frugal Foodie Mama just reached reached over 10,000 Pinterest followers!! And since she is one of my Online Blog Con blogging friends, I am helping her celebrate by being a part of her $400 Dreams to Reality Paypal Cash Giveaway. Please read through ALL the giveaway terms and conditions below. Giveaways like this require us to be pretty strict with the rules so make sure you check them out!